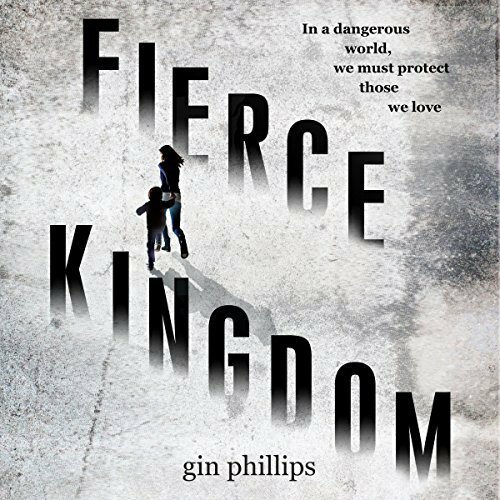 In a way I was not surprised to read that Gin Phillips didn’t set out to write a thriller when she created FIERCE KINGDOM. Because she hasn’t. Written one that is. In my view anyway FIERCE KINGDOM is a story about the bond between a mother and her son. They are in peril, which I guess is where the thriller tag comes into play, but the focus of the book isn’t really the danger or anything else much that is external to the relationship between Joan and her 4 year old son Lincoln. As a depiction of motherhood, especially motherhood at a time of difficulty, the book is excellent. Superb really. But as a thriller it is…patchy. The pair are visiting their local zoo one weekday afternoon and are making their way to the exit around closing time when every parent’s worst nightmare starts to unfold. Joan sees people on the ground and is that someone with a rifle? She picks up her son and runs back into the zoo. As it is one of their favourite places to visit Joan knows the zoo well and soon finds a good, safe hiding place. They stay here for a long portion of the story. This makes sense from a survival point of view but is not conducive to the thrilling element of the book. What we do discover in this section is how deep Joan and Lincoln’s relationship is and the extent of Joan’s mothering instinct. Will she, for example, risk her son’s safety to aid other people trying to survive? Should she? Even when she elects to move out of the relative safety of their hiding place there is a strong sense that the only reason is Lincoln’s protection rather than the author’s need to move the plot along. I found Joan a very believable character. Even when she makes some questionable decisions (one in particular gets criticised in many of the less glowing reviews of the book) I thought she was being consistent with her own previous character. And who among us really knows how they would behave when lugging 40 pounds of much-loved toddler through a darkening landscape populated by gun-toting nutters? I’m sure we would all make some daft moves. I must admit I thought Lincoln a little less credible. He seemed a little too clever with his almost genius-level vocabulary but he is a sweetie and the reader does rather desperately want him to use his inside voice and survive. But the thriller elements of the book did not work all that well, at times feeling very much forced into the narrative. For example there are a couple of passages where action is seen from a gunman’s viewpoint. They’re not particularly long or insightful and I don’t know what purpose they served other than ticking a box on the list of things modern thrillers ought to have. Also in the last third (or so) of the story Joan links up with two other zoo patrons trying to hide from the shooters: retired teacher Margaret Powell and teenage zoo employee Kailynn. This does help add some more traditional thriller-style elements to the story but it is a bit too late really and the narrative shift is abrupt and jarring. I felt that the book should either be a traditional thriller all the way through, in which case these other characters should have been introduced earlier and fleshed out a little more, or the entire book should have stayed with Joan and Lincoln. As is often the case these days I suspect this book’s misplaced marketing is largely to blame for my disappointment with aspects of it. Words like ‘electrifying’ and ‘suspense-filled’ do not apply to what I read. But if you are looking for a book that celebrates motherhood in a fresh way then you might want to give FIERCE KINGDOM a go. If audiobooks are your thing then Cassandra Campbell’s narration is a genuine treat. This entry was posted in Gin Phillips. Bookmark the permalink. A very fair-minded review, for which many thanks. While I can absolutely understand why the book wasn’t one for you, it sounds like it might be ideal for me: I love thriller-that-ain’t-really-thriller-type books! Off to the library I go . . .
Hope you enjoy it and I’m glad the review came across as fair because I really did like the parts that dealt with Joan and her overwhelming need to keep her son safe. Interesting setting for the novel, Bernadette. A zoo is a really effective context, and it’s believable, too. I understand exactly what you mean about marketing this one as a thriller, although it wasn’t. I’ve read a few books like that, and it reinforces my belief that publishers really need to market their books a little better. At any rate, I’m glad you liked the depiction of the mother/child bond. The zoo does make a really good setting Margot. Though I think I know why it is not a common one…people’s reactions to animals being hurt/killed can be extreme…many don’t seem to mind dead fictional humans but as soon as you start writing about dead fictional animals you are in for some scathing hatred. I may not have picked it up were it a typical thriller, but this actually does intrigue me, based on your description. I think I’ll try it out. Great review! I don’t know. I just don’t. But I always enjoy the book reviews here. They really get to the essence of a book’s characters and plot, strengths and weaknesses. That sounds like an interesting book but it would not be one I would pick for myself. However… The US cover is lovely, with carousel horses, and I have a weakness for carousel horses. And she is from Alabama, now lives in Birmingham, my home town. I may have to look into one of her other books. Funnily enough one of the reasons I chose to read this book was for the Alabama leg of my US Fiction Challenge but I don’t know if the book is set there or not…the entire thing takes place inside the zoo and we don’t know where it is. Perhaps you can recommend another author who sets crime fiction in Alabama? From what I read, the author’s inspiration for this book was a trip to the Birmingham Zoo with her son, but she deliberately did not set the book in a specific city or state. The only author I have read who sets her books in Alabama is Anne George, the Southern Sisters series. The stories are set in Birmingham and it is a humorous cozy series. I read the first book and it was fine but I did not want to read more… possibly because the characters are too close to home and I did not want to experience that. However, I have bought three more of them via the book sale, and plan to read them. My other suggestion would be Thomas Cook. I have three books by him, set in Alabama, but I have not read them. So cannot say from personal experience if they good or not. I have heard good things about his books. The ones I have are: Breakheart Hill, Streets of Fire, and The Last Talk with Lola Faye. Thanks Tracy, I will track down something of Cook’s if possible. I have already read Anne George some years ago and am looking for new-to-me authors for this challenge. I’ve been particularly keen to get to Alabama because my youngest niece started College there last September and as I haven’t got the opportunity to visit for real yet I would like to at least visit virtually. Which college? I hope to hear what she thinks of Alabama. At the very least, it is a beautiful state, green and lush. That I miss very much. She is at University of Alabama in Tuscaloosa (I’m not sure if there is more than one campus). So far she is loving it though not really sure how much she sees outside of the campus, her first holiday she went home to her folks as you do…she grew up in Los Angeles so wanted somewhere completely different for college which she has definitely achieved…I’ve seen a fair bit of the US during my visits to brother and his family over the years but not Alabama…yet. I went to college at the University of Alabama at Tuscaloosa, at that time I think the other campuses were just extension centers. Yes, Alabama is about as different from LA as you can get. But my experience (in the late 60’s, early 70’s) was that Tuscaloosa … or at least the University… was a lot different, much more tolerant. My first husband and I, both Birmingham natives, lived on a street with both black and white families, and that was very unusual at the time. And times have changed the area, a bit, I expect.